This trip begins with a scenic 45 minute drive to Salt Lake. 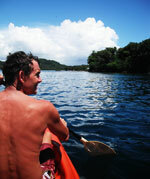 Choose from a single or double Kayak and then head off up river to explore the beauty and tranquility of the Salt Lake. After kayaking the lake we head out into the ocean to a small sandy Island for a beach picnic and snorkel. Keep you eyes open for turtles and reef sharks! This is the greatest fun for exercise and being on the water. You will be given a short introduction and lesson to paddle boarding. It’s easy and lots of fun! After you get the hang of balance and using the paddle we will head out to a small Island where we will paddle over a beautiful reef teaming with corals and fish. Copyright © 2012 Naveria Heights Lodge. All rights reserved.